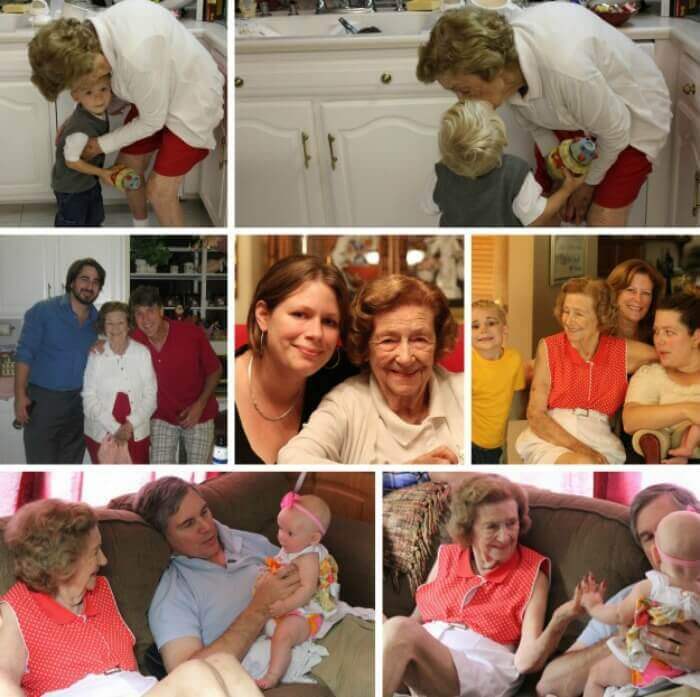 It’s taken me a while to get this Sweet Potato Casserole up because I can’t write it without getting weepy. When my husband and were getting married, my sister put together an album of recipes from family and friends as a wedding shower gift. As soon as I got wind of what she was doing, I specifically requested the recipe for my grandmother’s Sweet Potato Casserole, because this recipe is the best. We always serve it at Thanksgiving with mashed potatoes, mac and cheese, and my stuffing recipe. 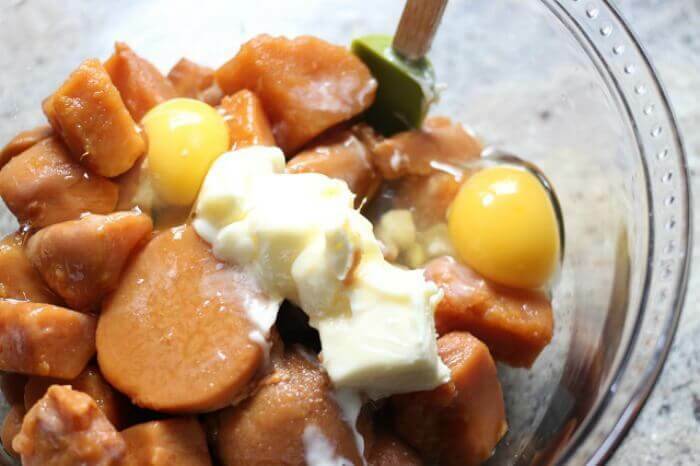 Yams – My preference is canned yams, but you could use fresh yams or sweet potatoes in this sweet potato casserole. Butter – Please don’t substitute margarine. We like salted butter, but unsalted will also work. Eggs – Regular eggs, nothing fancy to see here. Vanilla – Definitely use pure vanilla extract, not imitation vanilla when cooking or baking. Sugar – Plain white granulated sugar. Flour – All purpose flour. Do not use self rising flour as we do not require additional salt or leavening agents in this recipe. 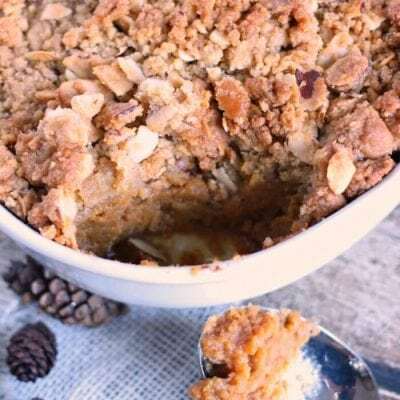 Brown sugar – We usually use light brown sugar, but dark brown sugar will work in this sweet potato casserole too. Almonds – Slivered almonds add the perfect amount of crunch and nuttiness to this recipe. How do you cook sweet potatoes for sweet potato casserole? We actually don’t cook the sweet potatoes (or yams in this case) for our sweet potato casserole, instead I like to use canned yams. If you prefer to use freshly baked sweet potato, then I’d suggest baking them in the oven, cooking the sweet potatoes in the crock pot or even steaming them in the microwave! Make sure your sweet potatoes are cooked until soft all the way through. How long do you bake sweet potato casserole? 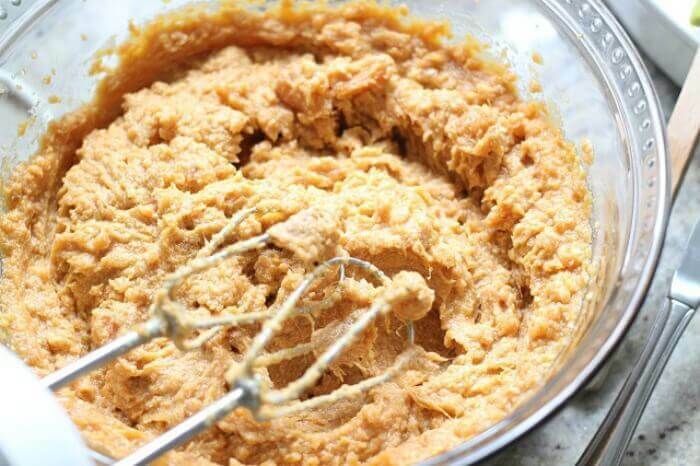 How long you bake sweet potato casserole depends on how deep your casserole is. Aas you can see from the pictures I tend to make mine on the deep side and so will cook it about 60 minutes in a 350 degree oven. Can you make a sweet potato casserole ahead of time? Yes, you can make a sweet potato casserole ahead of time. I usually make my sweet potato casserole up to two weeks before the holidays. Sweet Potato Casserole is delicious hot or cold, so leftovers are kind of a life goal. You can also make it up a few days ahead and reheat in the oven, or freeze it several weeks in advance! What type of canned yams in sweet potato casserole? I am partial to Bruce’s canned yams for this sweet potato casserole recipes. That said, if you don’t have canned available, fresh baked sweet potatoes work as well. I find sweet potatoes in the slow cooker give the creamiest result. Can you freeze a sweet potato casserole? 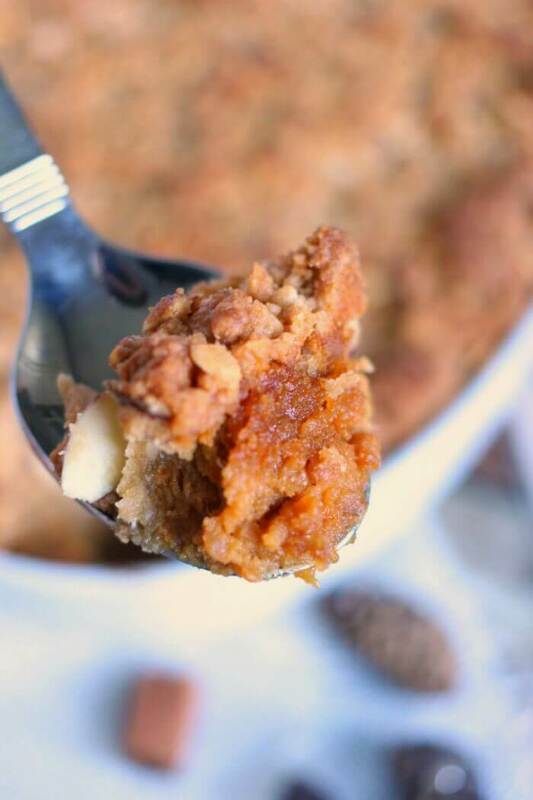 You can freeze a sweet potato casserole. To freeze a sweet potato casserole, make sure the dish has cooled down completely, then cover securely and place in the freezer . You can cook a pre-made sweet potato casserole in the oven by thawing it first and then baking for 30 – 45 minutes, or you can place it in the oven while frozen (make sure your utensils allow for this and cook longer (usually an additional 30 – 60 minutes. How do you reheat sweet potato casserole? If you’re heating it from frozen, we suggest letting it thaw on the counter for a few hours and then popping it in a 350 degree oven until it’s hot throughout (about 30 – 45 minutes). If you’re just wanting a scoop of leftovers, a quick 30 – 60 seconds in the microwave should do nicely. Corningware 12 Piece Bakeware Set – I got this Corningware set when Wesley and I were married in 2003 and we still use it all the time. Especially during the holidays! 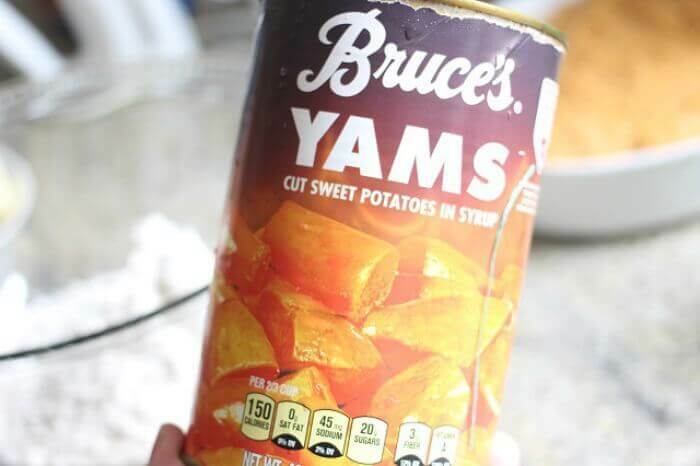 Bruce’s Yams, 40 ounce – use whatever yams you like, or even baked sweet potatoes if you’re in a pinch. But these are what we use in our casserole. I like to rinse the sugar off them first. Hand Carved Wood Trivet – I love a pretty trivet. We have a collection of all different types. Cinnamon Scented Pinecones – You guysssssss. Starting in August, I buy alllll the cinnamon cones and cinnamon brooms. I love them so. I also maybe buy pine scented candles. Because yasssssss. KitchenAid Classic Stand Mixer – admittedly, I don’t use it as often as maybe I should because #notabaker. But this sweet baby comes in super handy when I’m making a giant triple batch of this delicious Sweet Potato Casserole recipe. Or, my yummy Ginger Molasses Cookies recipe! Watch us make Sweet Potato Casserole live on our show, or here on YouTube! This easy Sweet Potato Casserole was a staple at our holiday dinners growing up. It's simple to make and will please even the pickiest eaters. 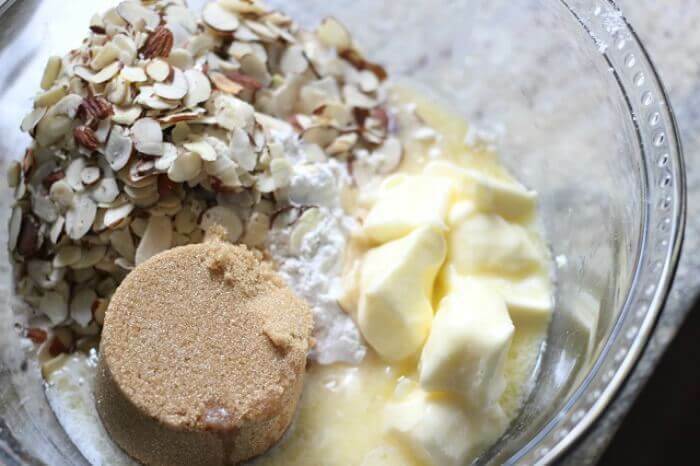 Combine BASE ingredients in a large bowl and blend well with an electric mixer. Pour into a greased casserole dish and spread evenly. 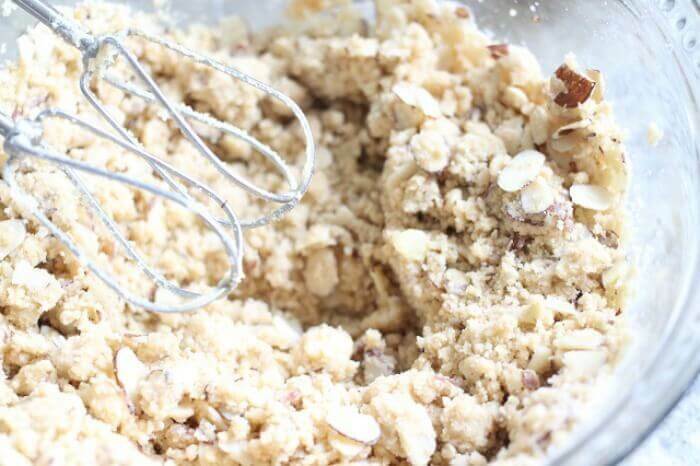 In a second large bowl, combine flour, butter brown sugar, and almonds, blend well with an electric mixer. Add additional flour as needed to make topping slightly crumbly. Distribute TOPPING evenly over casserole dish. Bake on center rack at 350 degrees for approximately 60 minutes. Topping will get brown and toasty. I cannot find any reference to oven temperature. 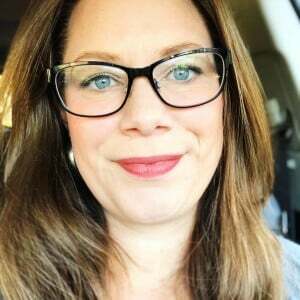 Please help! oh my goodness! 350F! I'm so sorry! Hello! What size pan would you say? I feel like that would be a lot to fit in to a 9×13 but I'm not sure. 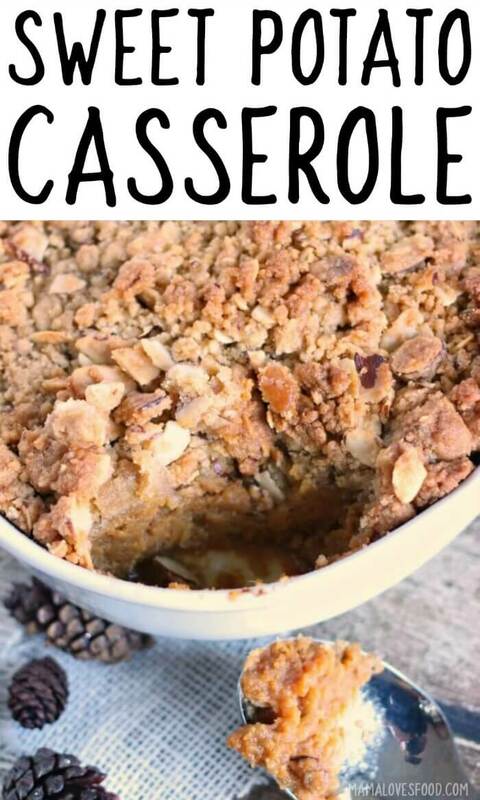 The topping on this casserole truly makes it AMAZING! 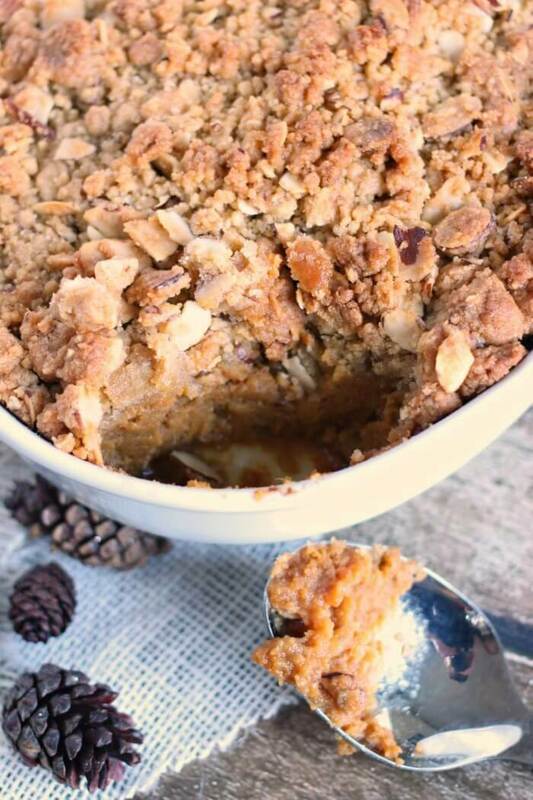 I am a fan of crust on my sweet potato casserole and this recipe NAILS it! What a sweet gift from your sister. Treasured forever and ever I’m sure! There’s nothing that beats a recipe that’s passed down from our grandmas, right? This sweet potato casserole is a must- have for holiday dinners and that topping has my name all over it! 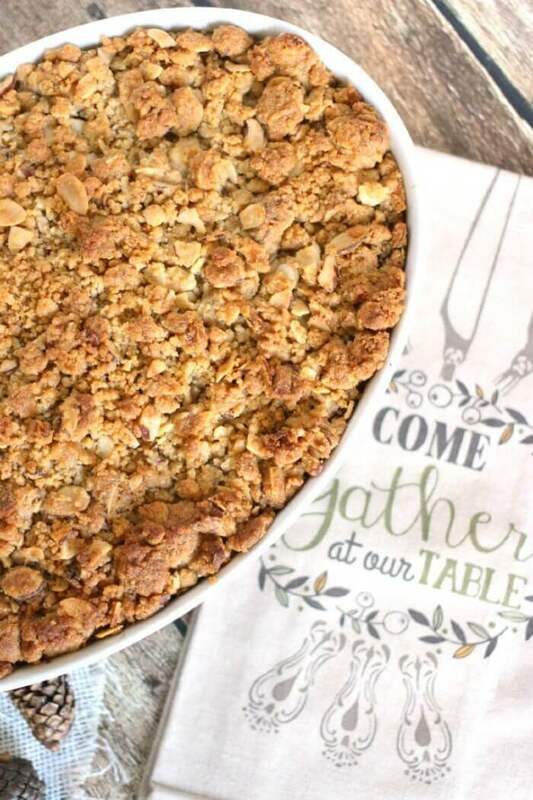 if making weeks in advance and freezing, do you put the streusel topping on before freezing or after thawing? How long would this keep in the fridge? Could I make this on Monday night and bake on a Thursday? Yuuum, April this looks so delicious! !